“In implementation, this looks like sport. This is revolutionary. It's as distinctive of the program as are the movements and the charter of functionality and variance. Our workouts are competitive events. 3, 2, 1 — GO! The Games are over and the results are in! The Top Female CrossFitter for 2008 is Caity Matter of Gahanna, OH, where she trains with Rogue Fitness. Tanya Wagner took second place and Gillian Mounsey took third. The Top Male CrossFitter for 2008 is Jason Khalipa of CrossFit Unlimited in Milpitas, CA. Josh Everett came in second, with Jeremy Thiel in third. The Affiliate Cup was won by the team from CrossFit Oakland. Congratulations to all the winners and thanks to all the volunteers, spectators, and competitors for a great weekend! 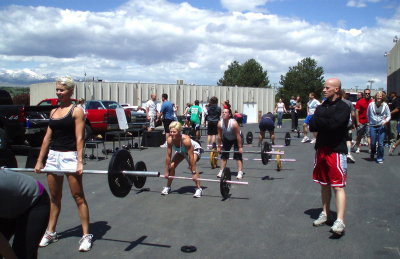 "Several affiliates gathered for the Utah CrossFit Challenge that was held at CrossFit 801 on May 24th. We had an awesome turnout with over 40 competitors and 70 or so spectators. The following for CrossFit in Utah has grown so much, and we are really excited about it!!" This event was a blast! There were actually only about 30 spectators...added to the 40 participants, that's where you get the 70. Anyway, the top 2 males and the top female from this event will be coming to the Games with us, along with a some of the trainers and affiliate owners who didn't participate in this challenge. See you all at the Games! Which affiliate is closest to Bountiful? Might have to stop by on my summer vacation . . .
Wasatch Crossfit in Kaysville is probably 10 minutes from Bountiful. Check out there site at www.wasatchcrossfit.com and get in touch with Damon. Great people up there at WasatchCF, they'll take care of you. If it looks like I can drop by, I'll give Damon a shout. Hooyah Utah! TP, you're welcome to come on down. We've got some monsters in Utah (Speal) and some new ones coming out of the woodworks. Good luck to our CF Games crew, I can't make it this year but we'll be sending a monster team down in 2009. Will try and do. It'll be nice to get some high altitude training . . . gasp gasp . . .
Information about competing in the Games, including rules, registration dates, and events. Updated to include 2009! Competitor profiles, interviews, and more. Find out what CrossFit affiliates are doing in conjunction with the Games. General information about the 2008 games. Learn about the Games' corporate partners and sponsorship opportunities. © 2008 CrossFit, Inc. All Rights Reserved.